14939 WILD WEST WATER FOUNTAIN home decor, jewelry, decor, decorations, electronics, fountains, floor mats, art glass, vases, garden essentials, fireplace screens. 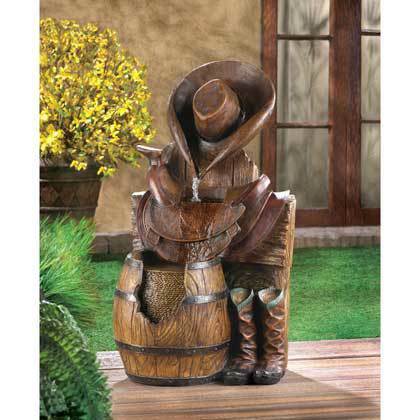 Hat, saddle, barrel and boots — here is a fountain with western roots! Sit back and relax at the end of a hard day’s ride as the water gently flows. Weight 16 lbs. 15" x 12½" x 26¼" high. Fiber glass and resin. Submersible water pump included.